For the second year running Loughborough headed East for a final Hurrah of the 2015-16 head race season at the Head of the Cam. Having heard how much fun was had last season a full trailer of boats made the long trek along the A14 to do battle with Cambridge traffic and housing estates. I’m not sure Nick and Walrus really understood why their boat for Leicester regatta on Sunday went via Cambridge, Mercedes SatNav says “recalculating”! Some members of the club were trying to turn back the years. Jerry and Emma’s trip down memory lane was somewhat thwarted by not only the demolition of their old boat house but the last minute change of venue from the combined colleges boat house to the Trinity Hall Boat House. Or did Mike just randomly park the trailer and unload the boats next to someone’s Boat House who was not around? Having used Andy Hill as a warm up in the second division Jerry drove Emma on in division 4 to take over 2 minutes off last years time and almost get revenge on Mike for overtaking them in his single in 2015. Mike in his single was only 15 seconds faster than them this year, he had better watch out next year. 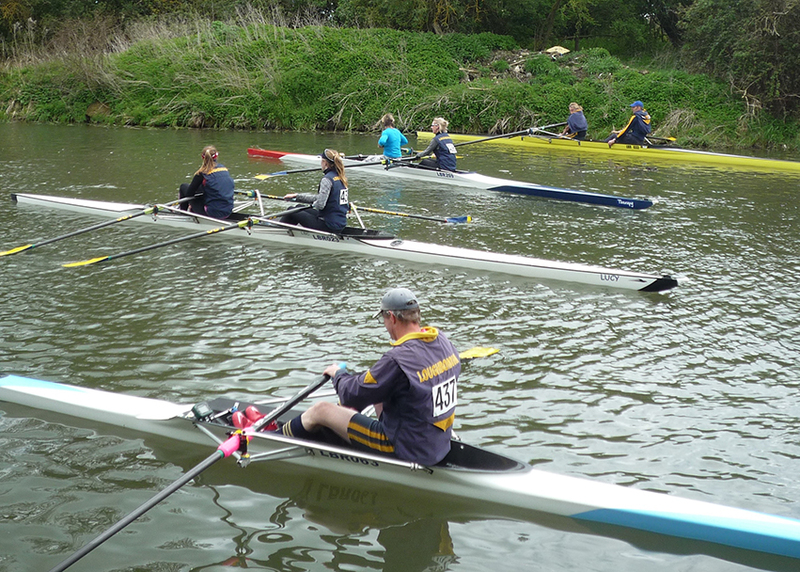 Perhaps Jerry and Andy must have been putting in some sneaky practices in non-club times when no-one else was around, as they romped home to a pot in the Masters Pairs Category. I wonder how much Jerry paid Charlie’s optician to ensure that he misread the date on his rugby tickets? Mike and Scott, in matching pink socks, shirts and faces had a good row for them in the double, demonstrating their unique sense of style to a bemused Cambridge audience. If only the audience realised the pink was to distract from their own equally unique rowing style. Perhaps Scott was distracted worrying how much money Sarah and Hannah were spending in the Cambridge shops. Jen and Sandra recreated their Mistresses double from 2015, this year they dumped Rosie and put their faith in Carillon. Sandra excelled herself, they reached the end of the course with not only no mud or bits of canal boat smeared on their bow ball, but also smashing their previous time by more than 4½ minutes. Vicky, after braving her first single head race in 2015 brought a friend this year. In their pair Vicky and Heidi romped down the course only 6 seconds behind Jerry and Andy, just a shame they did not have any opposition. In addition to those trying to regain their youth, this year we took some proper rowers! With captain Keith and Henry on spectator duty the Canzum coxless four came to double up in their four and smaller boats. They posted good times in all of their boats. The only one with opposition was Zoe and Erica’s pair who sadly missed a pot by only 15 seconds. Star of day, as happens so often, was Tom in his single. The only Loughborough boat in division 3 he romped home in under 11 minutes to win not only his division but was the fastest sculler of the day. So, two pots more than last year, and some notable improvements in performance made the trip worthwhile. The laid back attitude to organisation of a non-British Rowing event was a refreshing change from other heads races in the season. Well done to everyone who took part, lets look forward to the sprint season.